In a landmark development, the Gorkhaland Territorial Administration and the Sikkim government have decided to jointly demand the Centre to confer tribal status to all the Gorkha and Nepali speaking communities in the country. 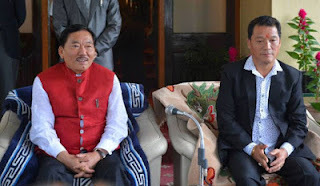 The decision was taken today after an hour-long meeting between Sikkim Chief Minister Pawan Kumar Chamling and GTA chief executive Bimal Gurung at Mintogang, Gangtok, the former’s official residence. The GTA is demanding tribal status to 11 communities - Bhujel, Gurung, Mangar, Newar, Jogi, Khas, Rai, Sunwar, Thami and Yakha Dewan from the hills - and the Dhimal community from the plains. The Sikkim government, on the other hand, wants the Centre to accord tribal status to all the left-out Sikkimese Nepali communities. After the meeting, a content looking Gurung said, “Mr Chamling is a senior politician with vast knowledge and experience. We will need to create a collective front to take forward the tribal status demand and his help will be very crucial.” During the meeting, it was also decided that the various Gorkha organisations of the country would be required to be mobilised, and if necessary, a pan-India forum created to give added impetus to the tribal status demand. Bimal Gurung Pawan Chamling, In a landmark development, the Gorkhaland Territorial Administration and the Sikkim government have decided to jointly demand the Centre to confer tribal status to all the Gorkha and Nepali speaking communities in the country.